Introducing Ghost: Does WordPress Have a Major New Competitor? It’s official: Ghost is to become a reality. For those of you who don’t know what I am talking about, I would refer to Ghost as a blogging platform that could become a genuine option for those of us who use WordPress to blog. It was first announced by WordPress developer extraordinaire, John O’Nolan, back in November 2012. At the time it attracted an enormous amount of interest, but was nothing more than a concept. But O’Nolan clearly recognized the potential he had in his hands and set about producing a prototype. Now Ghost is backed by a Kickstarter campaign that has already surpassed its funding target (with 28 days left to go). You know what that means? Ghost is going to become a reality. 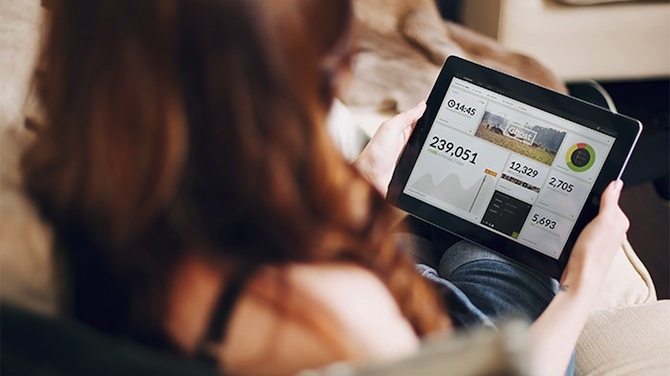 This brand new CMS has been built from the ground up to be incredibly intuitive. It is a response to the development of WordPress into something that is much more than just a blogging platform. That increase in functionality has inevitably led to an increase in size, options and complexity. Compromises have been made. Ghost is O’Nolan’s attempt to bring things back to basics and focus on creating a CMS that aims to do just one thing: allow you to blog with remarkable ease. The incredibly simple markup language Markdown is on the left, and a live preview is on the right. The focus is almost exclusively on the content, with subtle menu options at the top and bottom. This is how I would like publishing in WordPress to look — for now, I have to make do with the flawed Distraction Free Editor. Jealous much? There’s a lot more to love about Ghost — just check out the Kickstarter page and even try it for yourself. I don’t want you to think that I’m planning on abandoning WordPress any time soon. Although Ghost may be a wonderful concept, there is no way it is simply going to knock WordPress off its perch and become the new blogging standard. For instance, consider the extensibility via plugins and the design options via themes — that is not something easily replicated by any platform. While I think Ghost could end up being a more usable CMS for blogger types, it will not be able to compete with WordPress for sheer breadth of scale and usability in the foreseeable future. Ultimately, I think it’s a win/win. There will be people out there who will migrate to Ghost, thus providing us all with a more competitive blogging environment. And the introduction of a new and innovative blogging solution should only boost innovation across the board and influence WordPress’ development. I can’t wait to see how this story develops. I’d love to get your thoughts, comments and opinions in the comments section below. Ghost is mainly focused on Just write concept. You need not worry about mobile responsive designs. Bloggers need no more basis know-how, in case of Ghost. I highly doubt Ghost could overtake WordPress within 2-3 years. But the rate at which it is growing, it could really fear off WordPress. GHOST! Seems like there are big hands behind it! WordPress, yeah it’s also. I firmly believe that Ghost has future potential. Ghost is at version 0.3.3. Imagine what it may be like at 3.6+. I don’t see how one can have customization with themes and plugins ( as in WordPress) and retain simplicity and ease of use (as proposed for Ghost). En ce moment, beaucoup de projets très excitants voient le jour. Ghost en est un exemple, vous avez aussi koken.me qui est dédier à la photo/vidéo et qui est encore plus moderne. Une vrais application en ligne. I would love, Love, LOVE to see a two-pane Markdown Extra editor in WordPress as an optional alternative to the current editor. However I currently do all my blogging in Markdown and then paste the HTML into to the WordPress Text window; I wish I could blog directly in Markdown. And yes I’ve tried the Markdown plugins but they have too many issues and I don’t have the time to devote to building a better one. Maybe I could use Ghost to front-end WordPress? Hmm. We dropped WP for Statamic on our largest site and haven’t looked back. From what I can see, Ghost still uses databases which are fairly easy to hack, create expensive usage even on VPS or dedicated servers, and are slow. Our site is huge – 640+ full fiction chapters, doesn’t slow now matter how many people are on it, and it brutally fast. I’ll never go back to WP – Ghost is just WP redo. Why not something really new? @claudia = What did you switch to? Do you use NoSQL or something? Those are good points and I’m also looking to switch to either Statamic or Kirby for my next project. @Mike – Statamic (& Kirby) are ‘flat’ cms that don’t have any database. Blogging is something WP can do really well. I don’t see a reason for an alternative (although competition and new ways of simplifying things are always great). Where I rather think WP could profit is from competition or new ideas concerning cms. Now a lot of themes offer a way of page-building which leads to very cluttered way of building webpages. Somehow i dont believe that any SMS solutuon can shake WP position. The market is settled and WP is already synonym for CMS platform. I love this as a writing tool, Markup and live preview. Maybe as good or better than some of the existing writing apps! And it’s all hooked up to a blog engine. Talk about convenience! News things are always good to have. I can not as of now give any judgements since time has to pass. I just glanced through the links and read a few pages about Ghost. I think it will be very difficult to edge out WordPress. The number of themes, plugins and other tools both free and paid ones will be difficult by any CMS to reach in due course. I think WordPress is making a mistake by trying to be all things to all people out-of-the-box – blogging platform, CMS, app engine, etc. 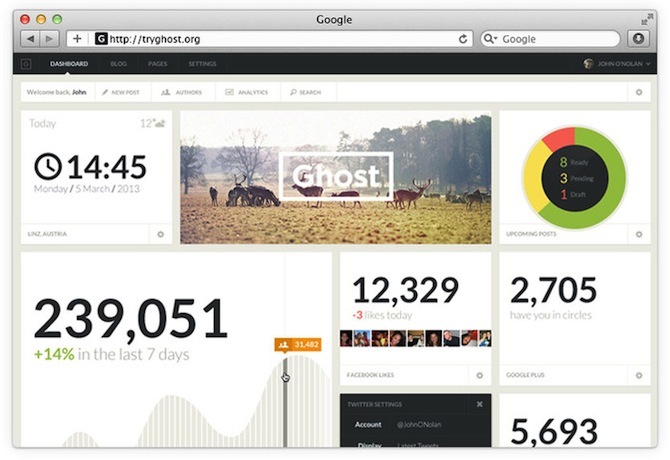 BTW, I see Ghost as a competitor as a blogging platform, NOT as a CMS. However, by focusing on doing one thing and doing it extremely well any application stands a chance of dominating it’s niche. For blogger-only users Ghost could be an extremely attractive alternative to WP. I think WordPress could continue to serve bloggers, website developers and managers, as well as web application developers, if it built the necessary hooks/functions into core, and then enable toggling of functionality so only that which is necessary for a given use case is activated. Also, plugin packages (multiple plugins) that focus on improving WordPress’ core functionality as either a blogging platform, or as a CMS, or as an app engine, makes more sense to me that than having the entire kitchen sink bundled into core and then operative on every installation. I don’t disagree with any of this, but perhaps being all things to all people (and “free”) is how you get big. Once there is a big userbase, third party developers can start making significant income selling products and services, and the new market just keeps growing. For better and worse, what sells like hotcackes is plugins/extensions/themes that offer all kinds of bells and whistles, extended functionality, and so on. As this occurs, the core development can start to lose focus and/or momentum with disagreements about what the product even is or should be. There is also a need to develop a commercial business model if that didn’t exist before and a healthy business relationship with commercial third party developers. This is quite a shift full of conflict potential that is hard to manage. Drupal and Joomla have gone through this in different ways in recent years. Following their rise to prominence, they had some challenges with focus, commercialization, and cohesion. WordPress is in a similar spot now, but it is unique in that it’s always had a commercial business model backing it (Automattic), so it dominated and controlled its own market early. Now that’s changed and Automattic obviously feels somewhat threatened and in competition with certain 3rd party business models. Being accused of outdated architecture, bloat, misdirection, lack of focus, and an overweening attempt to control the market is to be expected along with fork talk or “let’s build something better,” which has been going on for a while. Ghost, Dropplets and Leeflets are obviously precipitated by dissatisfaction with both the WP product and the proprietary behavior of its trademark holder. That’s all for the good — competition and diversity should clarify a lot of things and offer more options, higher quality products. I like the idea behind of Ghost, to take some of the best aspects of WordPress and create a simplified platform. There are some things I would rather have part of WordPress, and some things that needn’t be. I do like the simplified UI/UX and the use of Markdown front and center. This is amazing to me John! Great and much needed concept. I love WordPress but I have found I don’t use it for just a blog anymore. I mainly use the CMS aspect of it. And yes when it comes to just blogging or being able to manage editors and guest bloggers it can be a little tedious. I am loving the simplified approach towards Ghost. Also I am happy to see we can customize it with our own code or themes, there will be plugins and that it’s easy to use. Would love to see a sample site created by Ghost as a demo, so we can see, or even get a demo access to the backend. Great job and I look forward to it! I’m sure this is the first of many CMS systems to come down and out of the pipe. What anybody is really competing against is an ecosystem and history. Both of which take time to develop. Yep, I think that’s WordPress’ main weapon against any CMS, and is a very tough one to overcome. …said Joomla to WordPress in 2008. It looks great-love the editing window. I would give it a try — adding another tool to my repertoire but never abandoning WordPress. Meh. “The next great thing” is always appearing everywhere for all products. It’s all just noise. Devs and companies are constantly trying to seduce people with new stuff. I’ll wait until I have a need rather than jump because something is new. Interesting perspective…does anything new ever excite you? Personally speaking, I haven’t seen anything like this since I started using WordPress. There are actually a couple of things like it now. Several other WP developers are working on Dropplets and Leeflets, respectively a noSQL CMS and a minimalistic blogging application. Both use markdown. There are a couple of other new or relatively new and growing simplified and/or noSQL CMS or blogging applications out there that seem to be growing in popularity, like Anchor and Perch. I don’t see any technical specs or means to download Ghost. Is it PHP/MySQL and by invitation only? Ghost looks incredible for Bloggers. It doesn’t look they are aiming it to be a website “CMS”. WordPress has many, many years of theme and plugin development which Ghost won’t be able to compete with, in fact I am not even sure if they will want to compete with. Some questions I look forward to hearing from Ghost are will there be themes? Or are they taking it down the “standard” theme route. Plugins, whats their stance on this area? Customize-ability, will we have access to the back end code to edit? Anyway, looking forward to getting hands on. There will be themes! Both WooThemes and Envato have backed Ghost at a partner level – the biggest theme company and theme marketplace in the world, respectively. There will be plugins – we have over 20 developers signed up already who will be building stuff on top of Ghost. And yes, you will have full access to the back end code to edit! As for the rest of your comment – you were spot on! Excited to see what John and the team come up with at Ghost. I saw a preview of it yesterday and really liked the interface and potential. 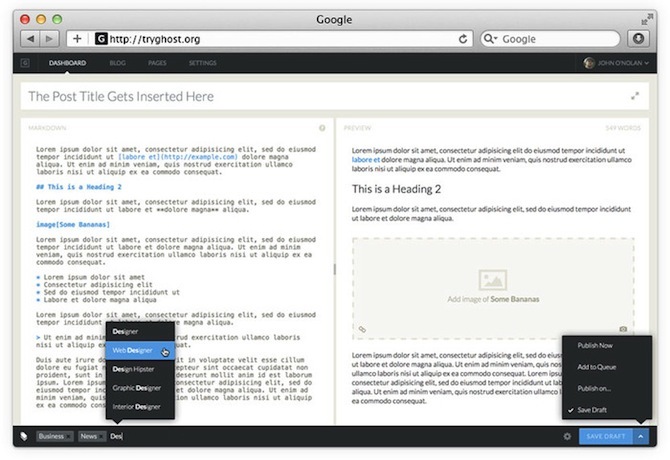 I think for designers and developers alike perhaps Ghost will be a companion platform to WordPress. For example, there are some clients who will be better served with a blogging platform and some clients who will be better served with a full site CMS. Perhaps with Ghost doing more of the heavy lifting in the blog world, it will allow WordPress to focus more on taking over the w– er, becoming an even better content management system for websites. Congrats on launching your baby! By adding theme and plugin support won’t you just be adding back the complexity that you wanted to leave behind? Or is Ghost just an attempt to reduce complexity for developer and end-users won’t notice any difference?